My, what a shift – Saturday: hanging out under Perth’s washed-out-blue skies, walking through heat-shimmering orange-dusty car parks, enjoying almost-40°C (104°F) temperatures, and necking cold beers. Today: back in English winter. Not exactly freezing – but a chilly ~10°C (50°F), grey, damp. 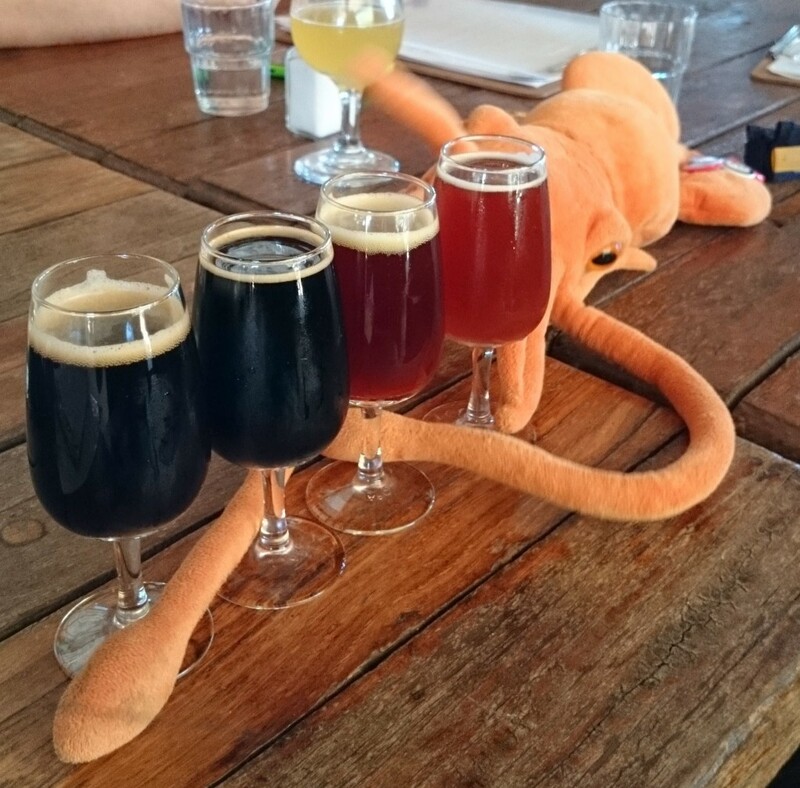 Anyway – on said hot and sunny Saturday I took a beery flash-tour of the Swan Valley, Perth’s doorstep “Wine Region” – which, like my homeland Margaret River Wine Region, has developed a small co-industry of boutique drink-in breweries. In nearly 20 years growing up in Western Australia and then a subsequent 15 years visiting about once a year I have never actually set foot in the Swan Valley. I’ve avoided Perth and surrounds in general to be honest… I prefer it “down home”. However on this trip I decided to explore where beer was at around the capital city, and the Swan Valley is home to a small but varied brewing cluster. 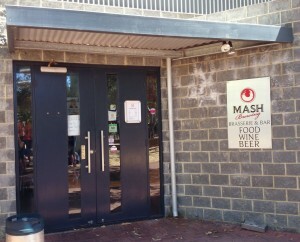 If you’re interested in a specific brewery I visited you can jump to: Ironbark Brewery, Elmar’s Brewery, or Feral Brewery – alas we were unable to visit Mash or Duckstein. Ironbark is the closest Swan Valley brewery to Perth city – we arrived at the brewery just before midday and wandered into the bar. The place has a cluttered “Heath Robinson” feel, like I was trespassing on some Aussie tinkerers verandah. The midday heat was at its near-40°C full-force – the supposedly cooling mist-spray seemed to vapourise before it could reach you… a cold beer was in order! (right) Loads of orange peel, very nice & refreshing though intense. (2nd from right) Fruity & a little odd. But quite drinkable. (middle) A bit TCPish – handful of smoked malt. Not easy going. Seaweedy. (2nd from left) Very light, herbal fruity, sort of fejoa-like. Peppery. (left) Clean and lightly caramel. Medicinal herby note to finish. (left) Light malt blast, Kat says “Green King Twang”, I think a bit Burton-y. Good though, IMO. (right) Yum. Rich dark honey comes through, finishing with a beaut hop resin from the Galaxy. 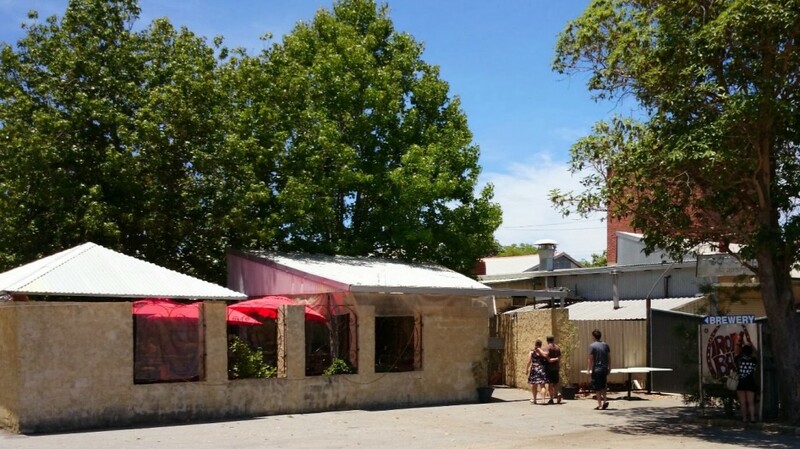 We were going to eat at Ironbark – the idea of wood fired pizza was appetizing. But having seen the pizza being constructed on pre-made cardboard-stiff bases, and in light of the general service level experienced, we decided to move on to the next brewery instead. I would recommend visiting Ironback Brewery to try out the beers, but probably do your best to to avoid the busyness of Saturday… and the pizza (if you have “standards” for “woodfired pizza”). A German-esque brewery with a “glass kettle” – the theme here is “purity”. 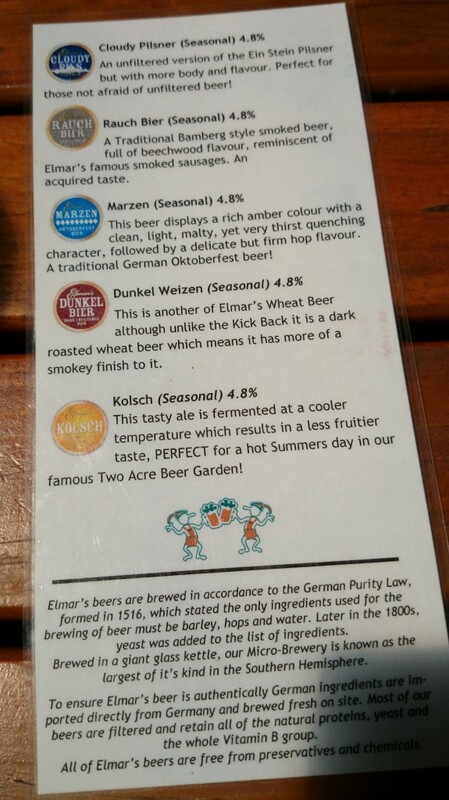 “A key feature of Elmar’s in the Valley is a giant glass kettle, used to enhance the flavours and purity of the beers.” They tag themselves as a “micro glass brewery”, which to me just sounds a bit odd – an attempt at humour perhaps. We stepped from the heat into the cool air-conditioned building with relief… short-lived since, understandably, they were busy and we had to take a table outside on the somewhat greenhouse-like open verandah. Once again cold beer beckoned! Our table was next to the outside bar where we discovered that only a handful of the beers on the list were available. 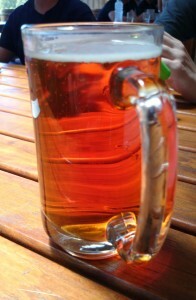 Thus my order for the Cloudy Pils and my brother’s for the Schwarzbier were met with a sad shaking of the head. So I grabbed a mug of the 4.8% Marzen – which was an acceptable “beery” beer but not quite reminiscent of märzens as I’ve experienced them, it didn’t quite have enough “oom pah”. We had ourselves a quick lunch at Elmar’s – a simple plate of cold bits and pieces and some breads and dip. Not a bad selection and amount as a light lunch for five. Although not particularly outstanding – like the beer a certain something was lacking, no real flavour excitement. (left) Oo, roasty toasty, good stuff. (right) Malty sweet but very pleasant ice cold on a hot day. Estery and quite complex. (middle) Smooth & slips down easy. Excellent finishing bite. Lemon pithy hop zest. 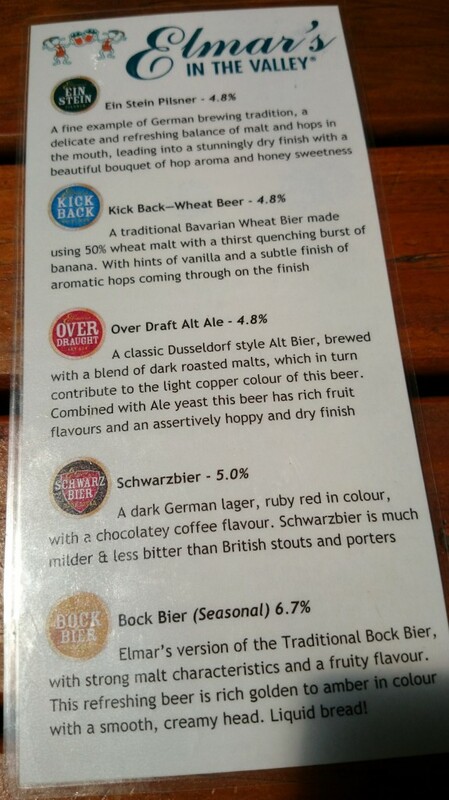 Overall the beers here hit a little above what I was expecting for the Aussie take on German-esque beers. Past experience has led me to expect a suffusion of blandosity. Nothing here really made me tingle… but the variation was good and the beers rather clean & crisp flavoured compared to Ironbark. The Schwarzbier and Cloudy Pils were both very more-ish – though they need to put more “schwarz” in their schwarzbier in my opinion, as more evident in the photo below! Colin With Elmar’s Beers – Schwarzbier on left. Bummer! I hope the tour-group didn’t have to wait long for their pick-up. 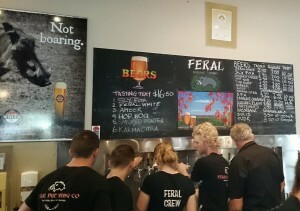 Feral can be found all alone on the east side of the Swan Valley (every other Swan Valley brewery being on the west). Feral is probably the only name in this list a British beer drinker is likely to have heard of – and that’s mainly thanks to Wetherspoon’s. Feral is one of the breweries they collaborate with for the “international” selection in the festival beer list, twice now in fact. They’re also the only brewery in this visit that I’ve tried beer from before – as bottled Feral White, Porter, and Hop Hog are readily available in bottle shops and also quite a few pubs. (left) Beaut light little hop gremlin. Light fizzy passionfruit juice. 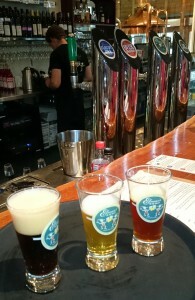 (2nd from left) Vanilla-sweet coriander cream soda. Lemony. (3rd from left) Peachy resin pepper melon. (3rd from right) Super sweet lychee juice. Quite different to the bottle. (2nd from right) Cabanossi on the nose, less so in the mouth, rich sweet shlenkerla-like body but less intense. Herbal cough syrup end. (right) Wow. It’s warmed up a bit by now and comes across just like a very good cask BIPA. Or maybe BD EFP’11. A hard-hitting lineup of flavoursome enjoyment. I wanted more of everything really, but there were beers untried so I grabbed a few more samples. (left) Tastes like BIPA that’s been in a barrel. Hops slightly muted, and a great sandalwoody spice picked up. Beaut beer. (2nd from left) Pow – alcoholic licorice rod. “liquid vegimite” says one of the party. Wish I could have more. (2nd from left) Toasted rye, light antiseptic, zesty. Big hop resin. (right) Iffy. Sort of melony overripe fruit. A bit nasty. Score so far: 10 beers, 9 lovely, 1 rather horrid. That’s pretty damn good going. The Raging Flem just didn’t taste right or good to me – this often happens when I see the words “Belgian” and “IPA” near each other. The name may not be helping with the perception here… on the other hand I just love the catchy name “Fantapants”, no idea why. The Barrique O’Karma – barrel-fermented version of Karma Citra I presume – is outstanding, phenomenal, memorable…. barrel-fermenting beer in new oak! Not sure if I’ve had a beer made this way before… I guess this is something that neatly comes out of brewing beer in a wine producing part of the world. I wonder what they do with the used oak. I’ve had “barrel aged” IPAs, which are generally so-so on the “IPA” front, hops subdued – but this is punchy, fresh, zesty, but also… barrely. Feeling mildly-drunkenly gung-ho and on-a-roll, I pop back to the bar inside to mop up whatever I haven’t tried yet… just a couple more beers (a few from the list were unavailable). (left) Smells like Oakham Citra, tastes like Japanese green pepper. (middle) Yep, barrelled Ipa. Sandalwoody zest and a vivid memory of hops. Another stunner if you like wood. When I wrote the above “vivid memory of hops” I’d not realised the B.F.H. was primary fermented in new oak and then dry-hopped as per usual. Again, like Barrique O’Karma, quite unlike the usual “barrel” + “IPA” experience. Another stunner – as I noted at the time. I bought a large glass of The Runt (which I had previously sampled) as a cleanser… and it is a good’un for the job. This little pair were a most excellent finish to a grand day out drinking. Sadly none of the really exciting beers were available to take away in bottles – maybe they are never offered in bottle? It was time to head, somewhat reluctantly, home… I’d certainly had my fill of beer for the trip, and my family companions were probably a bit tired of my beer nerdery, plus my poor sister was our “skipper” and we needed to get her home so she could enjoy a beer herself! Do visit the Swan Valley breweries and do give the full set a chance, they all have something to offer (I expect Duckstein and Mash are worthy as well, and hope to fill them in on some future trip home). For the “craft beer” drinker & nerd Feral is certainly and clearly where the elusive and ill-defined “it” is “at”. 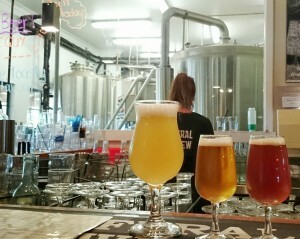 There’s really no comparing Feral to the other two breweries I visited. Feral is the seriously-“craft”, flavour-driven, experience-delivering *KAPOW* rockstar here. If there’s a flaw it’s that there was too much to take in during my single all-too-short visit! I wanted more of nearly everything… unless you really must go on a mad ticker-frenzy tour of the Swan Valley then I recommend making Feral a solid day-trip destination, work slowly and appreciatively through the beers over 3 or 4 hours on one day, then do all the breweries on the west side of the valley on another day. If you don’t have time for two days – just stick with Feral. 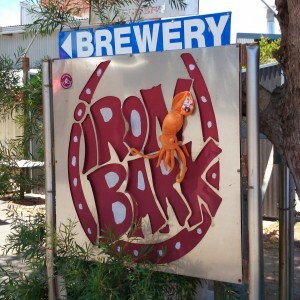 Ironbark is charmingly rustic, and like dogs and dog owners the Ironbark beers have their own rustic similarity to the venue. On a cooler & quieter day I can imagine myself enjoying a few proper glasses of their beer, but none of them felt like several-glasses-of beers. Elmar’s – slick is the word – clean venue, clean beers, but not boring. I could happily enjoy a hot summer’s day at Elmar’s just downing cold glasses of that Cloudy Pils punctuated with one or two of the others. Where Ironbark has a DIY-family-business shorts-n-tshirt feel Elmar’s presents as professional and business-suited. 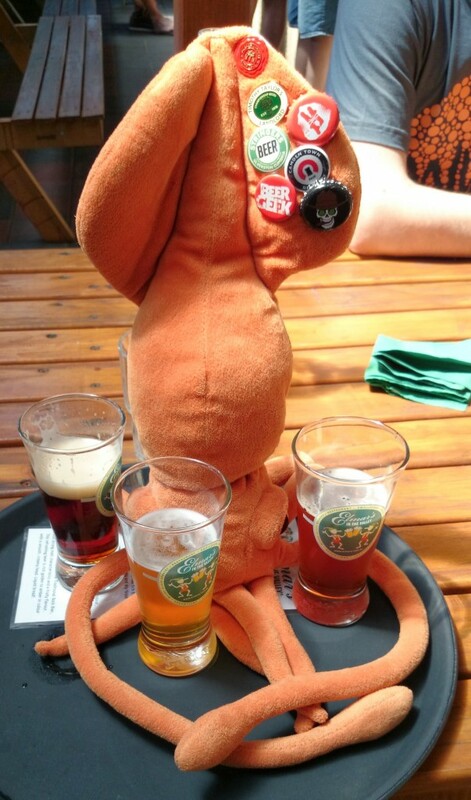 If I lived in Perth I’d be happy to return and give each brewery a proper lunchtime session – although in all cases I think a weekday visit would be recommended. Saturday, in summer, close to the “festive season”… they were all about as packed as you can imagine (no doubt there’ll be total chaos and hell once the summer holiday break hits). 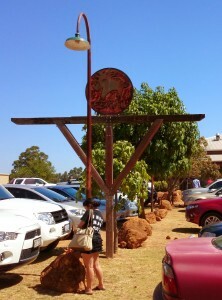 The beer is well and truly worth seeking in the Swan Valley. 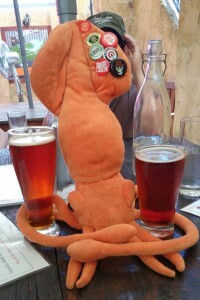 This entry was posted in Brewery, Road Trip and tagged Elmar's, Feral, Ironbark, Perth, Swan Valley, Western Australia by Yvan Seth. Bookmark the permalink.